There is so much to discover in the story of Esther and Mordechai and Haman's genocidal plot against the Jews. For centuries commentators have pored over the words of Megillas Esther, creating a rich treasury of explanation. 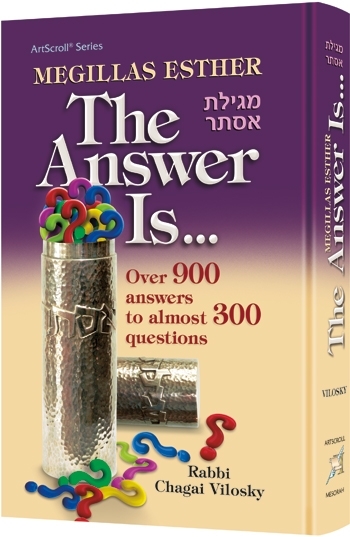 Megillas Esther: The Answer Is... draws upon these commentaries, helping us uncover the depth of meaning in the Megillah's words, and giving us a unique perspective on the world-changing events taking place in Shushan. In Megillas Esther: The Answer Is... we read the words of the Megillah together with the Alshich, Maharal, Vilna Gaon, Chassidic masters, Rav Chaim Kanievsky, and dozens more -over seventy commentaries, from Talmudic times and through today. Why did Vashti refuse to appear during the party? What really lay behind Bigsan and Seresh's attempt to assassinate the king? What was the significance of Achashverosh's signet ring? Why did Mordechai refuse to bow, thus endangering his people? Why did Haman turn to Esther for clemency? Important questions, all of these, and the commentators' many answers give us a new understanding of the Purim story. One of the most vital themes of Megillas Esther is the idea of hashgachah pratis, Divine Providence. 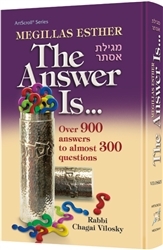 In addition to the questions and answers, Megillas Esther: The Answer Is... features a unique look at "Divine Providence in Motion," in which we get to peek "backstage" at how G-d quietly intervened in Shushan's complex world to ensure Jewish survival and victory. Wondering how to make your Purim even more meaningful? Here's a quick answer: Read through the questions and answers of Megillas Esther: The Answer Is... and begin to truly comprehend the greatness of Purim's hidden miracles.